September 2018 – Milkor will be officially launching its new 12 metre fast patrol boat, the MN Centurion, at the upcoming Africa Aerospace and Defence (AAD) exhibition, and is already close to receiving orders for the type. Nelis Strydom: Head of Business Development: Africa at Milkor, told defenceWeb that the vessel is almost complete, with only minor details still being finalised. The MN Centurion was first put in the water a few months ago, but already there has been a lot of interest in the vessel and Strydom is confident it is only a small matter of time before the boat is sold – he is confident it will probably be the first of Milkor’s new product range to attract orders. The MN Centurion is a 12 metre long stepped hull hydrofoil-supported catamaran, whose design gives it an exceptionally high top speed of 54 knots, although this is expected to increase as testing continues. 54 knots can be achieved with two 350 hp outboard engines; for military and coast guard clients an option of two 440 hp inboard diesel engines will be offered that will achieve even greater speeds. The vessel’s fibre-reinforced composite frame and built-in counter-radar material gives it limited stealth capability. The hull design allows high speed as well as stability and fuel economy – maximum range is 1700 nautical miles with an endurance of 14 days at surveillance patrol speed of 7 knots. Fuel capacity is 3000 kg. 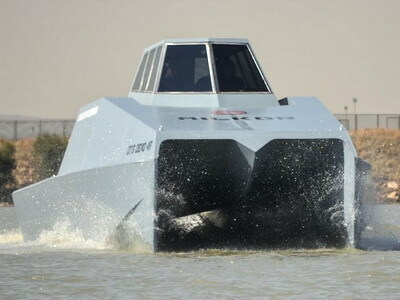 One of the salient features of the MN Centurion is that it can be offered as an unmanned vessel, and it has been tested as an unmanned surface vessel (USV), which follows the direction the industry is heading in. Milkor said the 10 ton displacement MN Centurion has been designed and configured for multi-role operations, and is ideally suited for long endurance missions. The command and control bridge is shock-mitigated, ballistic-protected and air conditioned, able to house the crew in safety and comfort (there are 2x hot-bunking sleeping berths). Milkor said the high-speed interceptor craft houses an array of surveillance equipment, communications equipment and weapons giving it a full spectrum of capabilities for any inshore or offshore operation. The vessel features a configurable aft deck space – it can be used for personnel transport – and can be configured to operate as an unmanned surface vehicle (USV). At the AAD exhibition a second, transportation version will also be displayed as a scale model. This vessel will accommodate 48 passengers and luggage. MN Centurion weapons options include a 40 mm radar-directed automatic grenade launcher, 20 mm remotely operated cannon or radar-guided missiles, but various options are available depending on client specifications. Although the first boat is 12 metres in length, Strydom said Milkor can alter the vessel’s length to meet different requirements and has had a potential client request a longer 14 metre version. The MN Centurion has been designed for a variety of applications, including surveillance, patrol, counter-piracy and asset protection, and is aimed at coast guards, navies and other operators. At the moment Milkor’s naval business is focussing on the MN Centurion, but may develop a small riverine patrol boat in the near future. The MN Centurion, as well as Milkor’s other products including unmanned aerial vehicles, grenade launchers, cyber solutions and 4×4 armoured personnel carrier, will be on display at the Africa Aerospace and Defence exhibition between 19 and 23 September.